For ready steady cook my starter was a simple onion tart. With my list of ingredients it seemed to me the obvious choice. 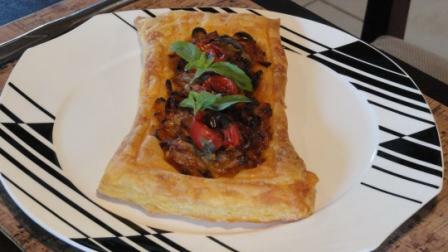 It would also be the first time I was using the techniques involved with the puff pastry – and it really led on to my main course. would send you some if I could! I use to love working with puff pastry as it can be so versatile. This looks yum! @Rose & @Tandy – I think that’s the beauty of this challenge! There are such a wide variety of amazing things one can do with the same ingredients. I am so interested to see what you’ve made – I obviously had ideas of my own when I choose the ingredients and you have made something completely different. Really good – well done on the tart! Well done and Friday greets to Dave.